Introducing the latest in our strapless, backless and invisible bras. From the manufacturers of the NuBra comes the latest strapless, back less, invisible bra. Unlike the NuBra, a totally silicone gel brassiere, the FeatherLite combines polyester, foam, and silicone gel offering the lightest and most comfortable fit ever imagined! Perfect for: Formal Dresses, Halter Tops, Strapless and Backless Dresses. • Foam bra cups with adhesive inside cups, plus front closure for cleavage and lift. • Soft and natural foam cups that are molded and invisible under sheer clothing. • NuBra FeatherLite instantly becomes a part of you with total freedom and flexibility of movement. • NuBra FeatherLite is easy to apply, easy to remove and is guaranteed to stay on securely (when instructions are followed carefully). • Self-adhesive cups are washable, reusable and easy to care for. Simply clean with soap and water, then air-dry. Once dried, the adhesive regenerates itself. • NuBra FeatherLite is not intended to replace your normal daily bra. However, it was designed for women who prefer "Total Freedom" from binding bra straps. 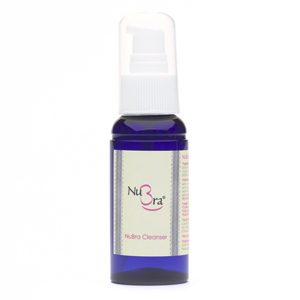 NuBra Cleanser - especially formulated cleanser for your NuBra products. The NuBra Cleanser is exclusively formulated with smooth and mild ingredients to perform routine and deep cleanings on the adhesive surface of your NuBra products. Use just one drop of the NuBra Cleanser with warm water and then rinse clear of the cleanser residue after every use for a lasting wear of your NuBra products. Directions: Wet the adhesive surface with warm water, and gently squeeze one drop of NuBra Cleanser on each bra cup adhesive surface. Rinse the bra cup with warm water to remove all cleanser residue. Shake off all excess water and place to air dry. Do not wring or twist bra cup. Dry on flat surface away from direct sun and heat. Ingredients: Purified Water, Glycerin, Cocamidopropyl Betaine, Amino Methylpropanol, Lavendar Fragrance, Dipotassium Glycyrrhizinate, Grapefruit Seed Extract, DMDM Hydantoint. Warnings: For NuBra products use only. Keep out of reach of children. If swallowed, give a large glass of water or milk. In case of eye contact, flush with water for 15 minutes. In either case, contact a physician or Poison Control Center immediately.